4 Pics 1 Word children party. Ferris wheel. Big wheel. Boy making fun of a girl. People jumping and dancing. Thanks for visiting 4-Pics-1-Word.com, here are the cheats for your favorite game. 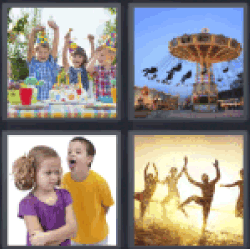 4 Pics 1 Word children party.